It happens every time. Dashing into the grocery store for the quick two-missing-items pickup, I am stopped by the delicious aroma of barbecue outside the market doors. There is something primal about the smell of charred, smoky meat. The cavewoman within me awakens. Salivation involuntarily starts. It need not be a hot, sunny summer afternoon, when the body craves salt replacement after sweating in the sun all day; a cold, foggy day works just as well, rousing the craving for the warmth of a fire and a good stick-to-the-ribs meal. No matter what the weather, impulse sets in and, damn, I guess we're having barbecued tri-tip for dinner. The dash into the store now includes a couple of side dishes and a six-pack of beer or a bottle of hearty Burgundy to round out the meal. Many local markets have smartly caught on to the desire for a hot cooked barbecue meal without the fuss of doing it yourself. There are countless tales of home grills gone wrong, from the whole roasted goat that tasted like "muddy hoof" to the Hawaiian, pit-cooked, translucent white pig with its teeth falling out à la Lord of the Flies. My own childhood memories of grilling focus on chicken legs cooked on the backyard hibachi, crisply blackened on the outside while a stringy, raw pink on the inside. Best to leave it to the experts, and in the North Bay there are plenty to choose from. And when experts are involved, there are bound to be opinions on the best or most authentic methods for cooking over fire outdoors. David Hoffman of Sebastopol's Fircrest Market offers a primer in Barbecue 101. "Real barbecue isn't done over live coals," Hoffman instructs. "That's grilling." Taking on a scholarly tone, he continues: "True barbecue, which developed in Texas, is done long and slow, with indirect heat. A wood fire, most often using mesquite, is built in a metal box, and the heat is funneled to the meat, like in a convection oven. The slow cooking takes many hours, which gives the meat its intense, smoky flavor and keeps it nice and juicy." While other grillers agree that this may be the most accurate interpretation of barbecuing, customers prefer certain items like kabobs, fish or veggies grilled. 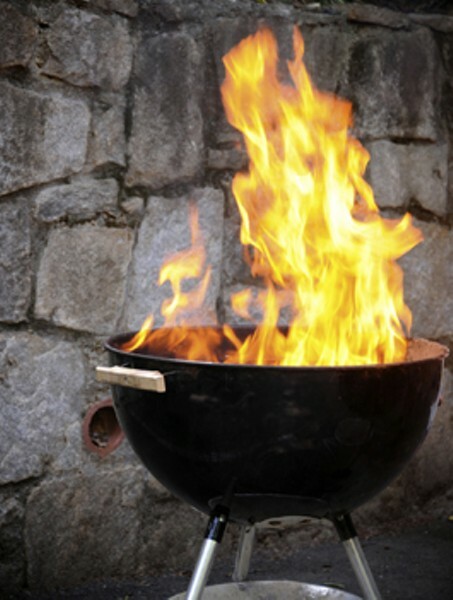 Some city ordinances do not allow wood fires, so gas grills are the market's only option. Most stores offer the barbecuer's trifecta of tri-tip, ribs and chickens, by whole or half, piece or pound. Others offer more specialized meats, sandwiches or sides. Customers usually receive a ticket with their order, pay inside and return to pick up their barbecue after shopping. Unless the inner pyro in me rears its fiery head, I happily leave the cooking to the pros and head out with an easy dinner, its heavenly scent wafting through the car as I drive home—or maybe to the beach. Here are a few suggestions for markets with barbecue to go. Andy's Produce Market Ducky's Barbecue offers sandwiches such as a beef brisket or pulled pork that has been slow-cooked for 14 hours. For a buck or two more, add a side of beans, slaw, cornbread or extra sauce. Don't forget the greens: kale, collards, chard and leeks, sautéed in oil and garlic. 1691 Hwy. 116 N., Sebastopol. Open every day, 11:30am to 7pm. 707.837.3425. Bill's Farm Basket Maxwell's Feel Good Barbecue proudly proclaims that the hot stuff they sell is "not your Grandma's barbecue," and Maxwell's may not be your Grandpa's, either. Chef Maxwell Meyer, formerly of Zazu and Seaweed restaurants, specializes in eclectic, mesquite-grilled meats, veggies and fruits. Try the soft Rocky chicken tacos with Cuban mojo sauce, black beans, rice, guacamole and veggie slaw for a complete meal. The chimichurri skirt steak and chicken apple sausage with pesto aioli and grilled peppers are also tempting. All foods used are organic and as locally obtained as possible. The menu changes seasonally, so keep a lookout for the hearty grilled soup come winter. A separate grill cooks up vegan and vegetarian treats like a grilled veggie and Bodega goat cheese sandwich. 10315 Bodega Hwy., Sebastopol. Open Friday&–Sunday, noon to 6pm. 707.829.1777. El Bringuito Market barbecues chicken rubbed with a secret family seasoning, and serves it with traditional accompaniments—rice, beans, tortillas and salsa. 17380 Sonoma Hwy., Sonoma. Open Friday, 2pm to 4pm, and Saturday&–Sunday, 11am to 8pm. 707.996.4912. Fiesta Market tumbles whole or half tri-tips in teriyaki or Italian garlic marinade. New to the menu are Willie Bird drumsticks. Corn on the cob, salmon steaks and oysters are offered when in season. 550 Hwy. 116 N., Sebastopol. Open Friday&–Sunday, 12:15pm to 7pm. 707.823.4916. Fircrest Market Texas-style barbecued chicken, ribs and tri-tip. 998 Gravenstein Hwy. S., Sebastopol. Open Friday&–Saturday and select holidays, 1pm to 7pm. 707.8239171. Lads Market presents an extensive range of meats and vegetables done up in sauces and marinades from around the globe. Island chicken teriyaki sticks, Brazilian churrasco beef kabobs, tandoori chicken skewers and Peruvian pollo a la braza—with garlic, vinegar, cumin and soy sauce—will spice up dinner even on a weekday. Grill master John Perezchica stresses that "all our marinades and sauces are made from scratch, and are original and unique. We pride ourselves on our specialties." All items are offered in the meat department and can be grilled to order for a $3 charge if not on the daily menu. 3800 Marlow Road, Santa Rosa. Open Thursday&–Friday and Monday from 4pm to 8:30pm and Saturday&–Sunday, 2pm to 8:30pm. 707.573.7081. Molsberry's Larkfield Market tempts shoppers with cowboy baked potatoes with sour cream and butter for $1.50, in addition to the usual grilled meat choices. 522 Larkfield Shopping Center, Larkfield. Open Friday&–Saturday, noon to 7:30pm and Sunday&–Monday, noon to 6:30pm. 707.546.5041. Oliver's Market Grill Central Station sells the full gamut of grilled items, including oysters, corn on the cob, potatoes and salmon fillets with garlic butter. The menu varies slightly between stores and is not offered at the Cotati location. The guys at the Montecito branch boast that they "have the friendliest service and try to make every customer happy." Customers waiting in line vigorously nod their heads in agreement. 560 Montecito Center, Santa Rosa. Open Friday&–Sunday, 11am to 7pm. 707.537.7123. 461 Stony Point Road, Santa Rosa. Open Friday&–Sunday, 11:30am to 7pm. 707.284.3530. Petaluma Market offers "a mean cheeseburger," according to head griller Bill Compton, who adds that "it's the best deal in town at a mere five bucks." Chicken with Italian rosemary dressing, tri-tip sandwiches and other meaty goodies are offered as well. 210 Western Ave., Petaluma. Open daily, noon to 5:30pm. 707.762.5464. Inverness Store serves its own version of surf and turf: charcoal grilled Petaluma fryers and barbecued Drake's Bay Oysters. 12784 Sir Francis Drake Blvd., Inverness. Open Saturday&–Sunday, 11am to 7pm. 415.669.1041. Santa Venetia Market Rocky's Quality Meats Located across the street from the Marin Civic Center, Rocky's offers a quick picnic dinner for those attending concerts or other events. Try the Burgundy-peppercorn marinated tri-tip or smoked baby back ribs. 71 San Pablo Ave. (at the corner of San Pedro Road), San Rafael. Open Mondays and Fridays, 3pm to 7pm. 415.479.2131. Scotty's Market uses a Traeger grill with cherry wood pellets for uniquely flavored meat. 620 Manuel T. Freitas Pkwy., San Rafael. Open Friday&–Sunday, noon to 7pm. 415.4792363. United Market starts cooking first thing in the morning, and continues till "the shelves are full," according to grill master Miguel Alizaga. United grills outside, then moves the meat inside for purchase. Turkey breasts, mild Italian sausage and pork loin are also on the menu. 100 Red Hill Road, San Anselmo. 415.456.1271. 515 Third St., San Rafael. Open Friday&–Sunday, from 8am. 415.454.8912. Brown's Valley Marketcooks up mesquite tri-tip, St. Louis&–style ribs and Rocky Junior chickens. Grilled asparagus, corn on the cob and salmon with garlic and lemon are offered on occasion. All items are cooked outside, and then sold inside the deli. 3263 Brown's Valley Road, Napa. Open Wednesday and Friday&–Saturday, 4pm to 7pm. 707.253.2178.